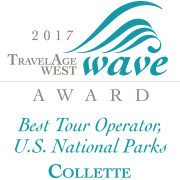 Collette’s Gateway is designed to provide you with a single place where you can find all the important travel information you need, plus a lot of experience-enhancing extras you’re going to love. Be fully prepared for your tour with travel tips from our experts and even a reading list with suggested books to help you learn more about your destination and get excited for your trip. Many of our tours offer optional excursions that are designed to enhance your trip. Learn what the options are for your specific tour and select what interests you. It’s a great way to choose your own adventures and personalize your journey. You certainly don’t want to hit any snags on your trip, so we’ll provide you with a list of important documents and information (like your airline schedule, for example) that will help you make sure that everything is in perfect order. If you’ve traveled with us in the past and you’d like to sign up to receive loyalty benefits, you can sign up through Gateway. If you’re already a member, you can login to check your credit balance. we encourage you to create your Gateway account. It’s just another way we bring you more peace of mind by being with you every step of the way.